I really do not understand how people let themselves be played around with Chavez cancer. I mean, is it not obvious that for a couple of months now he has started using his disease has an electoral card? He has little to show for 12 years of rule. The cancer seems almost a godsend for him as it allows him to play it for the masses as a victim, or a superhero that comes form the grave and what not, incubus included. That it is successful or not is not the issue, but that he manages to distract political discourse from his failures to his diseases is no mean feat. All revolutions die, eventually, and the more so if they are fake revolutions. The "bolivarian" one started its demise the day it lost the students of Venezuela, the very group that should have sustained its, intellectually. Since then it has been a long drawn agony, marked by increasing violence, corruption, drug trafficking and what not, to become what is today a mere narco-state in the making. It is thus only fitting that the other "revolution", the one that was propped by Chavez, the one that actually had at least some genuine revolutionary pretense, the "indigenous" revolution of Bolivia would find its demise in the repression of indigenous people. What they did to the Amazon natives in Bolivia who protested on ecological and native rights, has no name. It is not that so far it has caused the resignation of several high ranking officers (at least in Bolivia they still have enough shame that they resign), it is that an indigenous president is at the helm when indigenous folks, not of his tribe, are repressed. It does not matter what Evo Morales does from now on, he might close all media in Bolivia if necessary, his revolution is near dead. 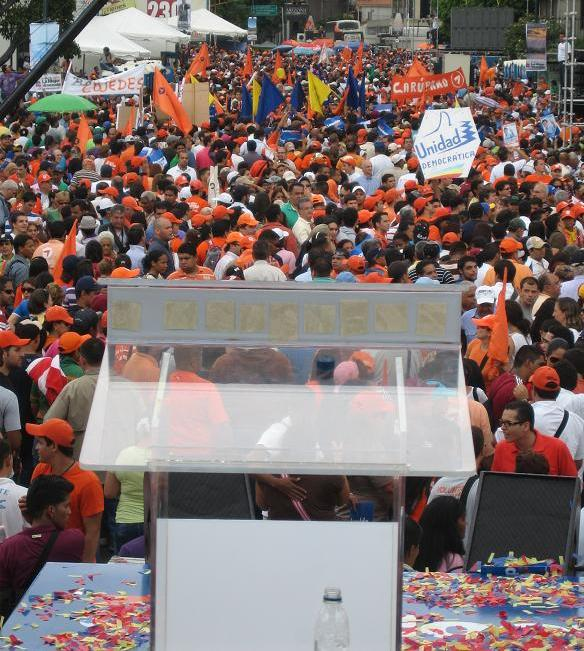 Leopoldo Lopez today announced officially his candidacy for president of Venezuela, for October 2012 vote. And he made it clear that his adversary was Hugo Chavez, not the opposition primaries. As the event would go on he would often enough remind people of his commitment to a new Venezuela, to opposition unity, to the decided challenge to Chavez (not necessarily chavistas). Having covered the travails of Lopez with the IACHR extensively gave me an invitation to cover the event. 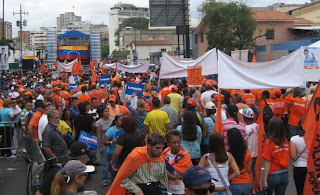 Not to mention that I was already at the start, when Voluntad Popular was launched as a movement. I suppose that being the last English writing blogger in Venezuela made it my duty to go and cover the event today instead of a well needed rest. But it turned out to be quite interesting and worth the time, my first ever candidacy launch! The day was cloudy which was as well. Saturday being shopping day in Chacaito parking was hell as attendants let people over-park. I was thus stuck in a basement for half an hour besides a car of cheerful VP guys waving a flag. But I got enough of waiting for a spot to open, left in a huff and went to park several blocks away. She is a commerce minister, she surely passed Eco 101. But Eco 102? Meet Edmée Betancourt. She is the commerce (and trade?) minster of Venezuela. I heard that she is rather affable in private but prone to rather outrageous/militant public declarations. But the one of this week deserve a special consideration because, well, if she really thinks so then she is either an ignorant or sabotaging Chavez. Yesterday my very estimable colleague Juan Cristobal asked in the comments whether I was endorsing Leopoldo Lopez. Fair question since I have been writing a lot about the Inter American Court proceedings that Lopez won brilliantly (even if it will do him little good it seems). Unfortunately the answer is not direct. You want to know why the Venezuelan regime is so upset about the IACHR ruling favoring Leopoldo Lopez? Consider these two pictures this week end, of a Chavez on his way to Cuba for more chemotherapy, waiting for Evo Morales, threatening right and left, or that one of Leopoldo running in a half marathon. There is part of your answer. Chavez left for Cuba Saturday. We must wonder about his disease induced insanity. He has been accumulating all sorts of mistakes and has not been dealing quite well with political adversity. He is letting his emotions rule and that can only complicate his political fights. One has a sense that he stopped caring and that he just wants what he wants. A little bit as the old Far West saying "let's see how many I can bring down with me". Or something to that effect. First there is that insistence in supporting Gaddafi against all logic even as the guy is AWOL and even as the last main backer, China, dropped him by recognizing the Libyan rebels. To this, Chavez can only manage to convoke an ALBA summit of his cronies and issue a common support declaration that has no echo anywhere, and even less at the UN. The only thing it manages is that the hubris of Chavez is forcing other countries into further international humiliation and discredit. They may be sensing that as they only sent their foreign ministers to the Chavez presided summit. This "summit" is not a matter of foreign policy, it is a matter of Chavez personal bond with Gaddafi. As such he has no qualm in bringing down Venezuela and the ALBA in this farce. More than ever we are confronted to the fact that Venezuela has long ago ceased to have a foreign policy and that this one has been replaced by a Chavez likes and dislikes policy. Juan Forero has slowly but surely evolved into a serious critic of Chavez, like in today's Washington Post, contrary to other pro Chavez writers who are exposed as frauds such as Johann Hari, be it in the Economist or in blogs that know better than the Hari of the world. Forero's comparison of Venezuela's hubris with Colombia's realism is damning for Chavez. He does not need to delve much in what is in stock for Venezuela: trends like the chart on the right tell it all. But I digress. The point is that Chavez is pissed off after a bad week and left with a flourish of insults, wishful thinking and threats, all in a single cadena. Aquí, clarísimo, lo que Luisa Estela tiene que leerse de la decisión de la CIDH publicada hoy. 226- Sin perjuicio de ello, conforme lo ha establecido en su jurisprudencia previa, este Tribunal recuerda que es consciente que las autoridades internas están sujetas al imperio de la ley y, por ello, están obligadas a aplicar las disposiciones vigentes en el ordenamiento jurídico. Pero cuando un Estado es Parte de un tratado internacional como la Convención Americana, todos sus órganos, incluidos sus jueces y demás órganos vinculados a la administración de justicia, también están sometidos a aquél, lo cual les obliga a velar para que los efectos de las disposiciones de la Convención no se vean mermados por la aplicación de normas contrarias a su objeto y fin. Los jueces y órganos vinculados a la administración de justicia en todos los niveles están en la obligación de ejercer ex officio un “control de convencionalidad” entre las normas internas y la Convención Americana, en el marco de sus respectivas competencias y de las regulaciones procesales correspondientes. En esta tarea, los jueces y órganos vinculados a la administración de justicia deben tener en cuenta no solamente el tratado, sino también la interpretación que del mismo ha hecho la Corte Interamericana, intérprete última de la Convención Americana. Luisa, si no lo quieres acatar, machete, pero no vengas a llorar después. [Actualizado] Pues no tuvimos mucho que esperar y ya las perras falderas del regimen han ladrado. Parece que la decisión del CIDH les cayo mas pesada que masticarse sapo de jardín. Based on the first reactions of the regime to the IACHR ruling on the Lopez case the least we can say is that they are beyond miffed, they are pissed. That is not a surprise. However what is a small surprise is the infantile arguments they are advancing. Let's start by the official communique from the foreign ministry which, we may assume, the official position of the regime. I am posting it below as lifted from their site. No translation, no time, use Google, but yes to the lies, contradictions and mistruths in it. El día de hoy, la Corte Interamericana de Derechos Humanos ha dado a conocer, a través de medios de comunicación, un pronunciamiento que había sido anunciado durante meses por voceros de la oposición política venezolana, y que recoge un conjunto de decisiones que el Gobierno de la República Bolivariana de Venezuela no duda en calificar de políticamente parcializado. Dropeth the shoe: IACHR to Venezuela "let Leopoldo run". Big victory for Human Rights! And thus the long awaited ruling arrived on the very last day. I need to read it for further comment but the result is as expected: Venezuela did violate human rights by condemning people without a trial. Period. LO LOGRAMOS, se hizo Justicia. ESTOY HABILITADO. Un triunfo de todos los que hemos luchado por los derechos y la justicia. Gano Venezuela! Now, for your own amusement you may either read the El Universal article, or the semi hysterical piece from the state TV, VTV, who has nothing better to do but drag out an old picture of Leopoldo waiving a gas mask to resit the attacks of the Venezuelan Nazional Guard. It is just starting, get the popcorn and watch the government bend and twist over and over to justify what cannot be justified. PS: or maybe, following how Juan noted how the Chinese are screwing us up, the red laces are there to distract us from that fact. UPDATED In yet another notable "fait-divers", a whole bunch of trucks were pillaged Tuesday night along a few private cars. This hit home really hard because it happened on a road that I use at least 4 times a month, and that I used last Tuesday afternoon at the same time as it all happened Wednesday late afternoon. The road I take most of the time between Caracas and San Felipe is the one that goes through Morón, a godawful joint that we call Mojón (turd). Moron was "founded" at the crossing of the road from Puerto Cabello to Coro, where the branch to Barquisimeto and the Andes start. It grew with all sorts of squatters (invasores) since the oil industry created a few complexes in the area. All anarchic of course, over the decades. 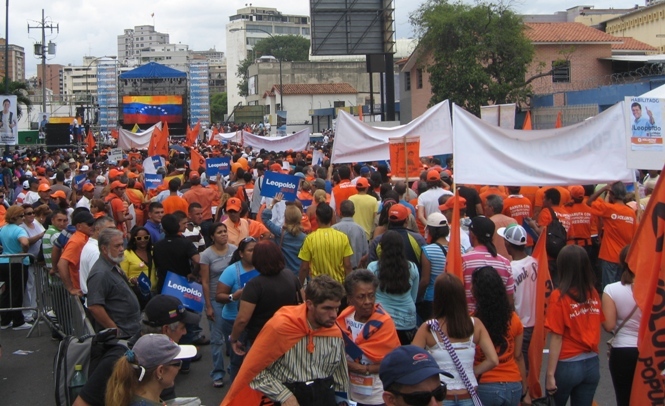 Sure enough, it is one of the districts where chavismo gets some of its highest percentages (often above 80%). The current mayor, a certain Matson Caldera, looks like the kind of guy you would not want to meet in a dark alley. Yet his personality cult is well advanced, next to Chavez in all sorts of billboards. Today it was Barquisimeto birthday. To celebrate the occasion the local governor, Henri Falcon (ex- PSUV)PPT decided to invite other governors. 7 came and the picture below is not at all the kind of picture Chavez wants to see, not at all. [UPDATED] There is only one way to understand the why in the electoral date change announced today by the CNE (Venezuela's election board): someone linked to the great beyond decided on that date October 7. It could be from a Cuban Babalao, to a Kabbalah cabal. Your pick. Because nobody is surprised by the separation of elections and by the anticipation of the presidential ones. Though I am surprised a little bit by the municipal elections pushed as far as sometime in April, close enough to sine die in Venezuelan parlance. Let's start with the separation of elections. It makes sense because the cyclic nature, in theory, of Venezuelan mandates mean that this year we have an accumulation of election that simply put, the CNE would have a very hard time to manage with an electoral system increasingly complicated and untrustworthy. As such, we all knew that it was a mere matter of time for the announcement. Though it is illegal because the municipal elections are way overdue (last in 2005), the governor and mayor terms expire in October 2012 and thus their election in December (maybe) is not acceptable either. That is, in a country of strong executive power its elections cannot be tossed around at will, no matter how legal the CNE claims its actions are. I was tempted yesterday to write a post about September 11, maybe linking it all to the original failure of the West in condemning early enough what was happening in Germany in the mid 30ies... Or earlier, or later, as one wishes. But the day is sacred enough now that one should not write with any hint of frivolity on such occasion, limiting our admiration to world wide ceremonies to commemorate the victims of that date, which include every continent and too many countries to count. One does not not whether the US is really that clumsy to blacklist 4 very high ranking chavista for arm and/or drug trafficking. After all, just a few hours before the local political class is about to learn of a rather momentous IACHR decision the US gives to Chavez yet more fodder to kick the table. Certainly the two decisions are absolutely unrelated and the question as to whether Bernal was an arm dealer had been answered long ago: we just got official notice yesterday. But chavismo is going to use the "intervention" exhausted old argument, among equally worn out arguments, to politically ban Leopoldo Lopez et al. under the excuse, say, that the US bans chavista "leaders". I am not going to speculate on why the US treasury suddenly decides to blacklist 4 guys whose names should have been blacklisted at least a couple of years ago. They have their reasons even if they go with a dreadful sense of timing. Rather, let's have fun at the expense of the one who has been a noted criminal since at least April 2002. Is Chavez in such trouble that international pariah statute does not rattle him? 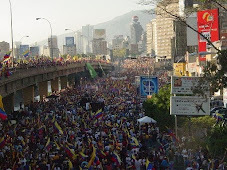 We have to wonder what are the objectives of the Venezuelan regime as it keeps piling up international errors. We can of course start by the continually renewed support to Qaddafi even as evidences of abuse, crime, luxury and cowardice are impossible to hide anymore. Even Russia and China, alleged friends and models of Chavez, are finally backing down on their opposition to the Libyan rebels, as Brazil is also caving in, not wanting to be left out completely from the Libyan reconstruction. And this support comes at a time where the collusion between Chavez and Muammar are about to be revealed as Libya's finances will start be explored in earnest with whatever documents can still be found. But if this was not bad enough, Chavez's regime and his sycophants are about to push yet another milestone as they seem ready to assume the risk of becoming pariah in their own continent. These days Chavez minions seem ready to send packing once and for all the Inter American Court for Human Rights as a ruling about to be released this week is looking more and more to be adverse. That is, we must suspect that the regime must have got wind of the IACHR decision and is already in frontal attack mode, not even damage control mode. Pues vean ustedes, la ansiedad del gobierno en cuanto a la Corte Interamericana de Derechos humanos, CIDH, me obliga a escribir una tercera entrada en cristiano. ¡Tres en tres días! Resulta que nuestro amigo Germán Saltrón cuyo aporte democrático ya resaltamos el domingo pasado quiso agregar mas a sus credenciales. Dijo así no mas, sin parpadear siquiera (digo yo porque para tener cara tan dura se necesita botox) que si la decisión de la CIDH en el caso de las inhabilitaciones no favorece al régimen venezolano, pues la CIDH se haría cómplice de promover la corrupción en el continente. "Si la Corte Interamericana le da la razón a Leopoldo López estaría violando el principio de la Convención Americana contra la Corrupción y eso pondría a la Corte en una situación muy difícil (...) Darle la razón a Leopoldo López es propiciar la corrupción"
Me permito darte el TU porque somos paisanos y todos sabemos en San Felipe quien eres, tu arrogancia, y que te botaron de un tribunal por inepta y posiblemente corrupta. Aquí todos sabemos que si no fuese por tu micomandantepresidente ni abogada serias hoy en día. ¡Quien quita y tal vez te darían trabajo en una notaria publica! Te escribo porque no hay perdón para tu ultima barbaridad esta mañana con Jose Vicente (otro pillo bolivariano con quien puedes aplicar ese principio de asinus asinum fricat). German Saltrón es un personaje extraño. Su función es de defender el régimen de Venezuela frente a cortes internacionales aunque a veces parece que lo hace con poco convencimiento. Sin embargo lo hace y cobra, ofreciéndonos sorprendentes barbaridades que no deberían salir de la boca de alguien que pretende ser un gran jurista. Su última salida esta reseñada en El Nacional de este sábado donde sencillamente dice que Venezuela no tiene que seguir el veredicto de la Corte Interamericana de Derechos Humanos en cuanto a las inhabilitaciones políticas que se aplican en Venezuela para cualquier político que se interponga a las ambiciones políticas del régimen. No soy jurista y por lo tanto no quiero polemizar con juristas sobre lo que es la ley y no lo es. Sin embargo poseo algo de sentido común, lo suficiente para observar el despropósito de algunas declaraciones del abogado Saltrón.